I think they were great in every respect. General knowledge of every aspect of planning and completing my solar project. Great help in getting me a solar loan. Not at this time. If someone asks me about solar panels I will certainly pass on a recommendation to use Orange County Solar. Vince and the crew were fantastic. Really nice people to deal with and spot on with everything they said they would do. 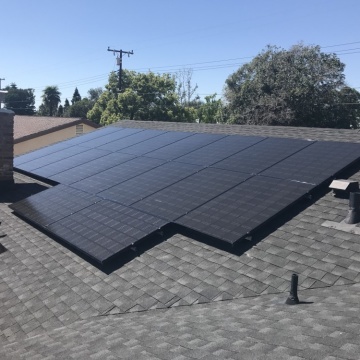 We love the new solar system, and extremely glad we went with Orange County Solar! We totally recommend this company and will encourage anyone looking at solar to go with OC Solar. The LOT. From the very first consultation to the day it was fully installed. We love seeing the big minus dollar amounts showing on our electric bill, and we run an electric car too. We are now considering a second electric car with our new found electric surplus!!! Not at present, but we are certainly passing on our recommendations to all our friends. Vincent Curcie is truely a man of his word, and it was a pleasure dealing with him and all his crew! Great team with terrific crew that installed on time and left the job immaculate. Thanks Vince! I was most satisfied with the communication at Orange County Solar. They were highly communicable at all times. I would like to recognize Vincent for his exceptional service.